Welcome to the latest instalment of Brian’s Travel Spot, which is, I appreciate, posted somewhat out of order, since I’ve not finished telling you about my previous American adventures. However, I’m sitting on the Chiang Mai sleeper as I write this, not long after dawn, and we’ve just begun our ascent into the mountains, so I thought this was the perfect time to publish this. I flew into Bangkok on Monday morning (having left Heathrow on Sunday afternoon) and spent the rest of the week in western hotels, cocooned in meeting rooms and air-conditioning, rarely being let out for long enough to see anything of the city, although I will have a weekend there when I get back from Chiang Mai. I can tell you, from the odd times I ventured out, that it’s hot (~35⁰C most days) and incredibly humid, with the river, which I was staying by, providing a welcome breeze. After five days of this, I escaped and made my way to Hua Lamphong station in the centre of Bangkok to catch the Chiang Mai sleeper, 13 hours on a train (the “special express” no less) to the heart of Thailand’s mountain country to the north. You see how I got on after the gallery. Regular readers will know my love affair with travelling by train, which I first expressed here with my coast-to-coast trip across the USA in 2015. Since then I’ve travelled around the north-eastern USA by train in 2016 and, in 2017, taken train trips in Japan, Vietnam and China before starting off this year with another epic US train journey from Providence, Rhode Island, to Tucson, Arizona, albeit undertaken in several stages. So, when it came time to plan my trip to Thailand and I’d decided that I wanted to go up the mountains in the north, it was only natural that I would take the train and, given the distances involved, that my preference would be for the sleeper. I bought my tickets on line with 12Go Asia having consulted the ever-invaluable Man in Seat 61, my go-to source for anything train-related. I needed to pick them up from the 12Go Asia offices opposite the station, so the night before, I’d escaped the confines of my hotel and made my way there by a combination of ferry, elevated railway and metro, arriving not long after dusk. Many of the photographs you see of the train and the station were taken that night when I wasn’t laden down with bags and trying to actually catch the train. Generally speaking, Thai Railways are much closer to those in Vietnam that I had experienced the previous year. This is in contrast to my recent experiences in on Amtrak, and my general experiences elsewhere in the world, including Japan and China, where you can’t get anywhere near the train without a ticket. Here I was able to walk right onto the platform and, had I wanted to, I probably could have got on the train as well. I had a similar experience the following day: we’d already left the station before the first ticket check. Having scoped the place out, I was much more confident about making the actual journey the following day. My first consideration was how to get to the station. I was staying at the Hilton, down on the river, and I could have retraced my journey from the night before. Bangkok has a reputation for terrible traffic and poor public transport, but this is changing rapidly with the construction of several new lines. Although my route wasn’t direct, it was perfectly doable, first taking the hotel’s free shuttle boat to Saphan Taksin, then switching to the elevated railway (known as the BTS or Skytrain: think metro on stilts if you’ve not been somewhere like Chicago) for three stops to Silom, next to Lumpini Park. From there, it’s another switch, this time to the newly-constructed metro (MTR), and a mere two stops to Hua Lamphong, which is the end of the line. All of this, by the way, will cost you just over £1 (30 Baht for the Skytrain and 19 Baht for the metro). If you are going to do the trip, just be aware that you need to buy a separate ticket for each and both systems only take cash, with the Skytrain only taking coins (although you can get change at the station). Although I like taking public transport whenever I can, in the end, I decided against it. If you look at the route on a map, it’s the equivalent of going around three sides of a square to get from the Hilton to the station. I also didn’t fancy negotiating the two interchanges (both of which involved a lot of steps) and two packed rush hour trains while carrying my rucksack. The final complication is that both Sky Train and metro have security checks before you enter the stations, which may well have meant taking off and opening up my rucksack, which is a major faff in itself. In the end, I wimped out and instead caught the public ferry across the river from the Hilton to the Sheraton (for the princely sum of 4½ Baht). From there, I walked into the hotel lobby, then straight back out again and got the bell boy to hail me a cab, which took 10 minutes in pretty much a straight line from the Sheraton to Hua Lamphong and cost just 83 Baht. You can see how I got on at the station after the gallery. If you’ve ever travelled by train, particularly in Europe, then Hua Lamphong station will look very familiar. The main terminus for Bangkok, it’s a grand affair, with an arch facing the street, flanked by decorative towers. Inside, a long, vaulted entrance hall fronts the platforms, the lines running north, all terminating at the station. Whether you come by taxi or metro, you’re most likely to reach the station on the left-hand side, where you’ll find yourself coming in between the platforms (to your left) and the entrance hall to the right. If you haven’t bought your ticket ahead of time/online, you can get one here, from any of the multiple ticket-windows that front the platforms. Having arrived at 18:30 for my 19:35 train, I had some time to kill. There are plenty of options for food at the station, including a food court off to the right of the entrance hall if you want to eat before your journey. If you’d prefer to get something to take with you on the train, there are a couple of convenience stores and multiple stalls. However, I’d already decided that I was going to eat on the train so I headed upstairs to a balcony on the left of the entrance hall, home to Black Canyon Coffee, which I spotted the day before and identified as a potential hangout, Hua Lamphong being rather short on seating. It was busy, but I managed to get a table for the price of an espresso (60 Baht) which was actually pretty decent and far better than anything I’d had at my hotel that week (not counting the stuff I’d made for myself). Black Canyon is never going to make it to the Coffee Spot, but it’s a more than passable option before a long train journey. I had checked the platform when I arrived and my train hadn’t been there, but when I sauntered down at 19:05, there it was, ready and waiting. The first thing to say about Thai trains is that they don’t run to a regular configuration. When I’d checked out the train the night before, there was a solitary first class carriage at the end, followed by three second class sleepers, the restaurant car and then my carriage, number 5, another second class sleeper. After two more second class sleepers, there was a baggage/freight cabin and finally the (diesel) locomotive. The train I caught had a very layout at the back, where there was now a very posh special carriage, which, from the looks of it, had its own bar. Fine, I thought, they’ve just put this on the end. However, it wasn’t the case, since there was no first class carriage at the back. Instead there were a pair of second class sleepers, then first class, then another second class sleeper, before we got to the restaurant car. After that, things were as they were the night before, with my carriage (number 5), two further second class sleepers and then the baggage/freight car and locomotive. You can see what I made of the train itself after the gallery. Whenever I’ve travelled by sleeper, going right back to my inter-railing days over 25 years ago, there has been one common theme: individual compartments. Even when I’ve had to share with strangers, as I did when travelling by sleeper last year in Vietnam and China, we’ve had an individual compartment to ourselves. Not so on the Special Express 13 to Chiang Mai. There are separate compartments in first class, but in second class, it’s one long, open carriage, with rows of bunks down either side of the central aisle, which makes it much more like flying business class, where you’re sharing the same space with everyone else. The layout is fairly simple. During the day, pairs of seats face each other on either side of the aisle, with the top bunk folded away. In this configuration, it’s pretty much like a standard second class coach, except there’s loads of room. At night, the top bunk folds down and the two seats are pushed together to form the bottom bunk, much as they do on Amtrak’s sleeper services, the only difference being that there aren’t any individual compartments. Instead, each bunk has its own curtain which you can draw across when you want to go to sleep, giving you more privacy than you get on a standard business class cabin. In many ways I prefer this layout. During the day, it does feel much more like you’re in a standard carriageway, whereas I’ve always found that as much as I’ve enjoyed the privacy of having a compartment, either to myself, or shared with others, it can be rather isolating, particularly since it means you can only look out of one side of the train. Here I could glance across and see the view from the opposite window, giving me a much better sense of where we were going. The rest of the layout is pretty simple. There are 40 bunks in all and there’s a door at one end, where you’ll also find a pair of toilets and a couple of wash basins. There’s plenty of luggage space, although it’s provided in open racks, one between each pair of bunks, but on alternating sides. Each rack also has a basket on top, which is handy storage for people in the top bunks. An interesting feature is that the sides of the luggage rack double as a ladders for the top bunks on either side, while on the ends of the carriage (on the side where there is no luggage rack) there’s a handy foldout ladder, which is put away when the carriage is inn seating mode. The downside of all this open luggage storage is that there’s a real possibility that someone could come along and walk off with one of your bags, although I think that’s very unlikely. If you’re really worried you can bring a bike chain or something similar and chain your luggage to the rack. I briefly considered it, but discounted it largely on grounds of the additional weight. I did, however, ensure that my passport, wallet, laptop and camera came into the bunk with me, since they would be the really disastrous items to lose. Everything is fairly easily replaceable. Another nice feature is that each of the top bunks has a little mesh basket where you can put small items like a wallet or your glasses. I’m guessing that there was a similar feature in the bottom bunks, but I didn’t actually notice. The top bunks also have a pair of straps running from the ceiling to the edge of the bunk, which, I suspect, are there to stop you falling out, although I’m not sure how effective they would be! Each bunk has an individual reading light, although I couldn’t get mine to work. In the upper bunk, there’s no window, while in the lower bunk, you’re next to a full window, with curtains for privacy and, once the sun’s up, to keep the light out. That said, the main carriage lights were always on and the curtains were fairly flimsy, so it was never very dark. The last thing to say about the carriages is that they are fairly basic. There’s no power or Wifi, although there is air-conditioning, which is vital in Thailand. This is powered by individual generators, one per carriage, so the train makes a real racket when it’s stood at the platform. There are also a number of fans hanging from the ceiling at the level of the top bunks, although these were never on during the entire trip, so maybe they are only there as a backup. You don’t really notice the air-conditioning until you step between carriages, where the doorways (which are often left open to the elements) aren’t air-conditioned. Then the heat and humidity hit you! I was on the train and settled in by 19:20. Although I’d requested a lower bunk, they sell out fast and I’d ended up with an upper bunk, Seat 3, to be precise, at the front of the carriage. Naturally, I got on at the back and had to walk through with all my luggage. A word to the wise: the internal doors are really narrow, so much so that I couldn’t get through without taking my rucksack off! The lower bunk (Seat 4) was occupied by Rosie, a student nurse from Canada. We sat and chatted for a while and although the two seats were quite close together, they were wide enough so that you didn’t have to sit directly opposite each other and hence could avoid knee-clash. We departed on time at 19:35 and trundled through the centre of Bangkok. Although dark, it reminded me very much of Vietnam, where the train ran down streets, next to houses, cafés and restaurants. It wasn’t as bad here, but it felt very similar, particularly the regular level crossings. 10 minutes after we left, the attendant started making up the bunks, which involved pushing the two seats together to form the bottom bunk, which meant we lost our seats. Next he made up the two beds, using the bedding which was stored on the top bunk, and hung the tasteful, green curtains, one for each bunk. I took this as my cue to head down to the restaurant car to eat, although the restaurant car attendants (in distinctive orange shirts and waistcoats) also come through the train taking orders and bringing your meal to your seat. Judging by how few people were in the restaurant car, I suspect that most either brought their own food or took this option. I got to the restaurant car just before 20:00. It’s not as grand an affair as, say, the Amtrak dining cars, but it did the job. There’s an extensive kitchen at the front, then there are four tables on either side, each with four hard, fold-down seats. There was a choice of four set meals, each costing 210 Baht and consisting of five courses. None of these were vegetarian, but one had three vegetable courses (tofu soup, jasmine rice and fruit), one seafood (Tiger Prawns and stir-fried vegetables) and one meat (Chicken soup) while the others all had at least two meat courses, so I went for that. Served in a plastic tray with compartments for each course, it was hardly high cuisine, but filling enough. Having been deprived of my seat at such an early stage, I took laptop to the restaurant car and the staff were happy to let me sit there and use it for as long as I liked. Despite being an “express” we made plenty of stops on the way out of Bangkok, maybe averaging one every 15 minutes. We called at Don Mueng Airport after an hour, a distance of 20 miles of so, which gives you an idea of just how slow we were going! That said, we ran parallel to a major road and often the traffic was going at the same speed as us and more often than not it was stopped in nose-to-tail traffic jams. I made my way back to my seat at 20:45 and was amused to see that the attendant was still going, having done about two-thirds of the bunks, so if you want to keep your seat for as long as possible, try booking seat 40! Of course, this assumes that the process always starts at seat 1 and not at a random end of the carriage, so to be on the safe side, you might want to go for the middle of the carriage, which, I note, is a lot quieter than either end, where you get a lot of train noise. Plenty of people had got on at the intervening stops, so by now, our carriage was quite full. I’d guess, just from looking and listening, that at least 50% were non-Thai. By 21:30 most people were in bed or at least had curtains drawn. I’d joined them, clambering up inelegantly, finding my bunk spacious enough that I could, with some difficulty, just about sit up and use my laptop. At 22:30, I called it a night and tried to get some sleep. You see how well I did after the gallery. I had worried about getting up and down to the top bunk, particularly as I had started the trip with a bad back. It had pretty much seized up on me during the London Coffee Festival, but I’d managed to loosen it up since then and the only real problem I had was when sitting down (the hard seats in the restaurant car, for example, were particularly bad for my back). As a result, getting up and down proved not to be a problem although I didn’t win any points for artistic merit. The top bunk is less spacious than the bottom on (and 80 Baht cheaper) but was more than adequate for my 6’2” frame. It was just long enough for me to lie down flat and had just enough headroom for me to sit up. Id brought my laptop and camera bag up with me, since they were the most easily stolen items and would cause the most problems to me if I lost them. Again, I had been a little worried about squeezing them in, but the bunk was wide enough to accommodate both them and me. All-in-all, it was more spacious and more comfortable than flying business class and a fraction of the cost. I went to sleep about 22:30 and woke not long after 06:00, having slept tolerably well. I’d still describe it as a series of interconnected naps, but it was far better than the flight over when my back was still playing up, limiting me to about three hours sleep. It was also better than I managed during my first two nights in Bangkok, when I was suffering from jetlag. While I’ve had better nights, in the context of my recent experience, it was a glorious night’s sleep. The coffee was awful, by the way, and quite possibly instant. I was also given a cake after my breakfast which may have been provided in pity since I didn’t eat my meat, but I wasn’t about to complain! I had my first sight of the mountains at 06:50, just as my breakfast arrived. Up until then, we had been passing through forests and open farmland, with the occasional house and the odd station we did not stop at. We stopped at Mai Tan Noi, after which the landscape changed quite dramatically. We made a long, slow climb up a steep-sided, forested valley before going through a long tunnel. I took this opportunity to make my way back to my seat, by which point quite a few people (maybe one third of the total) had left the train, judging the number of empty seats and bunks. By now (07:30) most people were up, including Rosie. Since the two seats behind us were free, I took them, partly so I could go sit facing forwards, but mostly to give us both some more room. Immediately after the tunnel, we pulled into Khun Tan, where we waited for about 10 minutes for a southbound Chiang Mai to Bangkok train to come past. About five minutes later we set off, the line going back to a single track and becoming very windy before broadened out into upland valley, ringed by mountains on all sides. By now we were on the final approach to Chiang Mai, the valley broadening all the time. Our penultimate stop, at 08:25, was Lamphun, which, like every station we had passed and/or stopped at, was beautifully clean and well-kept. One thing I did notice though, was that there were no announcements inn our carriage, so you have to have your wits about you if you don’t want to miss your stop. We reached Chiang Mai on time at 08:40. As I stepped out of the station, I was immediately harassed by various taxi drivers, Any thoughts I had previously entertained about being able to walk to my hotel, carrying my rucksack, had evaporated (melted?) on my first day in Bangkok, so I took the first reasonable-looking one, a lady named Phan. The taxi ride was straightforward and, at 200 Baht, was probably over the odds, but still under £5, so I couldn’t really complain. Within half an hour of arriving, I was in my hotel, where I was reminded of the main problem with sleeper trains: you usually arrive well before check-in time (in my case, over five hours), so I finished this post in the lobby, which at least had air conditioning, power for my laptop and Wifi. You can see how I got on when I returned to Bangkok a week later, this time on the Special Express #10, by which time my bad back had got a whole lot worse. For more about taking the train between Bangkok and Chiang Mai, plus some suggestions for other overnight train journeys in southeast Asia, see this article by The Smart Local. 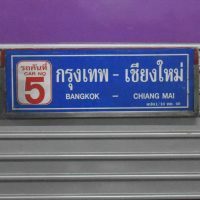 This entry was posted in Bangkok, Brian's Travel Spot, Chiang Mai, Thailand by Brian Williams. Bookmark the permalink. LOVED the Chiang Mai sleeper piece having done exactly the same trip during a four week trip to Thailand – you really brought all the detail back! I’m glad you liked it. It’s such a great way to travel! Very happy to have found your post; not that I ever took a train in Thailand. Seem to have missed out on that when there. However, I have travelled extensively by train in China, more recently in Canada. I love this mode of travel. Regarding where to hang out while waiting to board. In China I nearly always head to the 2nd floor fast food outlets – usually KFC – where I can relax with a coffee and watch everyone below. I am sure Chinese stations can easily hold 10,000 people! Chinese stations are indeed huge. And, once you’ve got the hang of them, very well designed.